Employees at a Florida hospital have come under fire for social media posts showing them inappropriately handling a newborn. The photo and video were posted on a Snapchat page belonging to a nurse at Naval Hospital Jackson, Action News Jax reports. 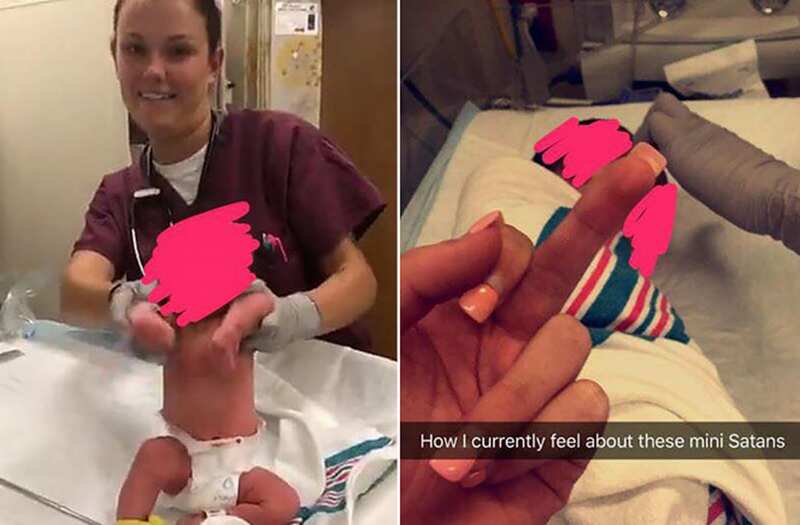 In the photo, a female nurse is seen giving the newborn the middle finger. In the caption she wrote, "How I currently feel about these mini Satans." A video posted on Snapchat shows the nurse's friend holding the baby up and making the newborn dance to 50 Cent's "In Da Club." The photo and video quickly went viral landing the employees in hot water. In a message posted on Facebook the hospital, which provides care for members of the U.S. military, said it had contacted the parents of the baby and the nurses were no longer working in patient care. "We are aware of a video/photo posted online. It's outrageous, unacceptable, incredibly unprofessional, and cannot be tolerated," the statement read. "We have identified the staff members involved. They have been removed from patient care and they will be handled by the legal system and military justice."